Before the holiday rush begins, why not enjoy a couple of weekends filled with Magic! Guilds of Ravnica to be specific! 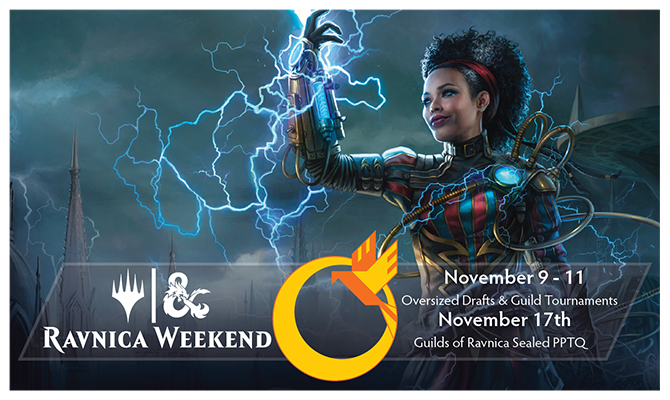 Coinciing with the release of their very first Magic / D&D crossover - the Guildmaster's Guide to Ravnica, Ravnica weekend is a break from the ordinary drafting that you've done before. And to add to that, we've been given some really nice additional prize support in the form of guild prints and specialized foil basic lands. Here's how you can get your hands on them! On both Friday and Saturday, our drafts get a pack larger. If you've ever been a few cards short of a really excellent pool, you'll enjoy one more opportunity to build that sweet sweet draft deck! Winners of each drafting pod will choose a guild and receive 2 basic lands from that guild's colors and a matching print! Looking for something unique? Why not try our Guild Kit Sealed. Your $25 entry gets you a guild kit and up to 4 rounds of pack-per-win swiss. Just your wits and a brand new deck against your rival guilds. Show up early to get your favorite guild. Already bought a guild kit? No problem! Just bring it and $7.50 and you can join in the fun too! In a more competitive mood? Why not come to our very last Preliminary PTQ! Winner of this heads to through the very last round of Regional Pro Tour Qualifiers and then (hopefully) onto the Pro Tour! 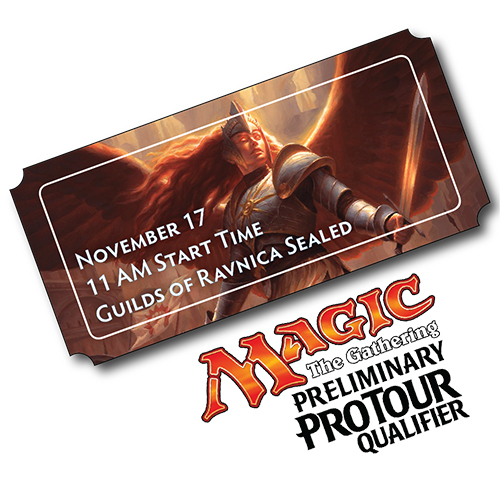 The format for this very final PPTQ will be Guilds of Ravnica sealed! Prizes: Prize pool of 3 Packs / player plus an invite to the RPTQ for the winner of the event. Click the link below to head to our online store and preregister today!